The site for “The Commons,” as Garrett Hall was often known, is on a cross axis suggested by McKim, Mead & White for expanding the University out from the Lawn. 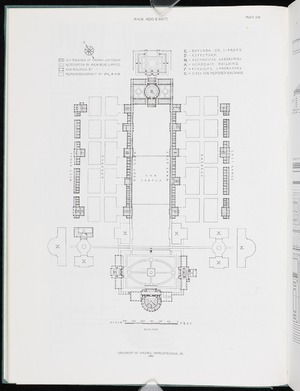 Though the refectory was the only building of the Beaux-Arts-inspired plan designed by the firm, their concept of tightly and symmetrically organizing the campus was highly influential well into the 20th century. 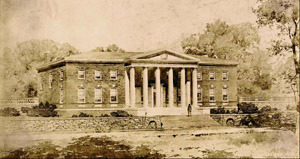 Once again, Stanford White led the design of the new University buildings. 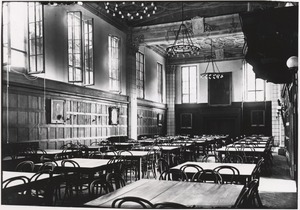 While his façade for Garrett Hall was more restrained than those of the monumental Cocke, Rouss, and Cabell Halls, the interior of the dining hall complemented the exuberance of White’s Rotunda interior. 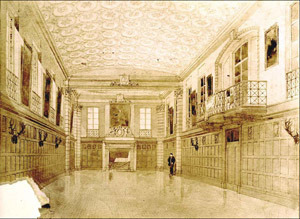 With oak paneling, an elaborately sculptured plaster ceiling, and enough seats for half of the student body, Garrett Hall was far larger and more elegant than Jefferson’s hotel dining rooms. 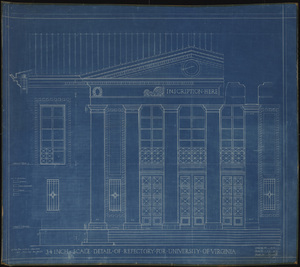 When budget constraints threatened the plans for the two new buildings, Alderman stated: “I am determined, above all things, that the dining hall shall not fail, and shall be a worthy building, such as will take a real place in the life of the University of Virginia…. The President could get along very well for a number of years, I think, without the house.” He believed that the refectory was essential for bringing the University community together.